To imagine the horror Kim went through the last night of her life is inconceivable. Below are the facts we know from her final hours, and a map to show the location of events. We hope that what we know will some day lead us to what we don’t know, and solve her mystery. Kimberly Simon was last seen leaving her home at 9197 River Road in Marcy shortly before 6 pm Sept. 18, 1985, as she headed to meet a friend at Whitesboro Junior High School on Route 69. The last hours of Simon’s life were believed to have been spent with at least five individuals known for devil worship and their dark obsession with death, investigators said. Screams were heard at another hangout called the “Water Tower” near Hart’s Hill Elementary School in Whitesboro. 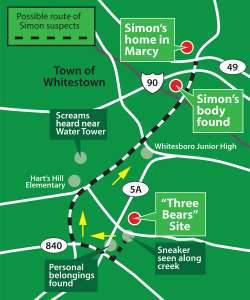 One of Simon’s shoes was seen along the Sauquoit Creek near the “Three Bears” site. Some of her belongings where found along Clinton Street near Carolyn Court Apartments. She was reported missing at about 11:30 pm that night. If anyone has additional information about that night please contact either Retired investigator: Jim Helmer (jim.r.helmer@gmail.com) or Current investigator: Dave Matrulli (dmatrulli@ocgov.net, 315-798-5575 or 315-527-3577). Help us solve this crime. Those responsible need to be brought to justice.